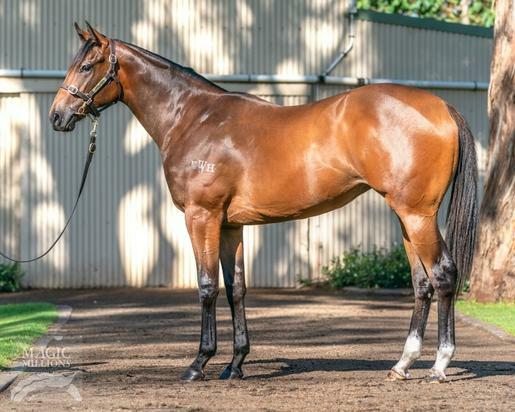 Beautiful filly purchased at 2019 Magic Millions Yearling Sale for $90,000. This filly is a Christine Cook Ladies only lease. Military Bay (g. by Hinchinbrook). Winner at 1000m in 2018-19 in Aust. Problem Solver (Hinchinbrook). 2 wins at 1200m, A$301,410, to 2018-19, Wyong Magic Millions S., GCTC Magic Millions P., 2d ATC PJ Bell S., Gr.3, Your Local Greengrocer H., Australian Turf Club H., 3d ATC Snitzel H.
Nic's Vendetta. 4 wins at 1100m, 1200m, A$221,305, to 2017-18, ATC TAB Highway H.-twice, 2d Scone RC H&NWRA Country Championships Qualifier, ATC TAB Highway H.-3 times, Bowermans Furniture H., 3d ATC TAB Highway H., City Tatt's RC TAB Highway H., Scone RC Vinery Stud H.
Eclair Infinity. 3 wins at 1350m, 1500m to 2017-18 in Macau. Noble Scorn. Winner at 1850m in Aust. COIN COLLECTION (Penny Red). 6 wins from 1400m to 2100m, NZ$118,800, Rotorua Challenge P., L, Egmont Cup, Taranaki RC Hurlstone Earthmoving & Civil H., Wanganui JC Guthrie Bowron H., 2d ARC Dunstan Feeds H., Taranaki RC Andres Pies H., Speights Dozen Day H., 3d Taranaki RC Waikato Stud Opunake H.
Sweet Revenge (Justice Prevails). 5 wins. See above. Ned. 7 wins at 1200m, 1600m, CJC Westenra H., Marton JC Nu Farm H., Manawatu RC Davis Trading Co Ltd H., Hawkes Bay Bowlers Punters Challenge H., Avondale JC Frank Sing H., 3d ARC Ellerslie Gateway Apprentice Jockey H., 4th ARC Great Northern Challenge S., Gr.3. Sal Tarrago. 3 wins. See above. Mystery March. 7 wins-1 at 2-from 1200m to 2200m, Avondale JC Somerville TAB H., 2d ARC Ra Ora Stud H., Waikato RC IRL Sitrite H., Avondale JC Jan's Ponsonby TAB H., Avondale Function Centre, Cambridge JC Export Meats H., 3d ARC Ellerslie Function & Convention Centre H., Jaguar S Type H., More FM H., Avondale JC Direct Forms H.-twice, Broaching H., WRC Central Forklifts H.
King Kalab - Hong Kong Dollar (H.K.). 10 wins-1 at 2-from 1150m to 1650m, Waikato RC Glenview H., HKJC San Miguel H.
Tyrant. 6 wins at 1200m, 1600m, Avondale JC President's H., Sportsman Filter Sprint H.
JAY PEE'S SPECIAL (McGinty). 5 wins from 1400m to 2400m, ARC Mitchelson Cup, L, Counties RC Winstone Aggregates H., 3d Waikato RC Fayette Park Grosvenor P.H., L.
EL PRESIDENTE (Dante's Fury). 10 wins from 1200m to 1600m, A$1,024,515, WATC Railway S., Gr.1, RJ Peters S., Gr.3, Asian Beau S., Gr.3, Roma Cup, Gr.3, Bunbury RC Patrons South West Breeders' P., WATC Summer Beau H., Pocket Trim H., 2d WATC WA Week Aquanita H., 4th WATC Kingston Town Classic, Gr.1.